Here at Vining Shipbrokers we pride ourselves on the service we offer to both Boat Owners and Boat Buyers. When the Vendor is satisfied with the price obtained and the buyer is happy with the boat then we consider it a job well done! I cannot thank you enough for the efforts you made to secure our ideal yacht. After 50 years of sailing in and owning a variety of vessels, I know what I want, and the brief I gave you was detailed and demanding, indeed another broker told me a while ago that “The boat you are looking for does not exist”. You were happy to spend as long as it took showing us boats which might come close to our ideal, and when nothing quite fitted, you went searching. When you produced our dream boat we were amazed, and the way you helped us through the entire purchase with patience, integrity, and good humour, went far beyond what was expected. I will definitely use your services again, and recommend you highly. While we have hardly been able to use Chrysalis at present due to my operation (our son took us out for a days run), we have been able to spend a many hours looking over it and examining it in detail. We are extremely pleased with the boat, it really is the perfect launch for us. We wanted to let you know how much we appreciate the way you looked after us and the utter consideration you gave us right from the moment of our initial inquiry, during our stay in Picton and the purchase process, and then taking complete care of the post purchase shipping arrangements. Not only did you look after Chrysalis until it could be shipped to Auckland but pro actively covered every conceivable contingency so that we always had total and absolute confidence in you. It is rare today to find someone with those old fashioned values; you do not just talk about them but live and practice them. You turned what can be a traumatic and stressful experience into one we can look back on with pleasure. You did everything with such open professional friendliness and in doing so pre-empted every issue. We have not hesitated to commend you to our friends and contacts and should a potential customer need a reference we will be only too pleased to provide it. We should also take this opportunity to say how friendly and helpful we found the people you organised to carry out the services required to complete our purchase. This is not surprising as like attracts like, so thank you yet again. It’s good to see you recommend Vinings on your website. Phil has been an unbelievable help to us through the whole process of buying the boat. The marina isPineHarbourwhich should be good for you as they are very accommodating. We live in Maraetai 5 minutes away which is very handy. The arrangements you suggest are very helpful. 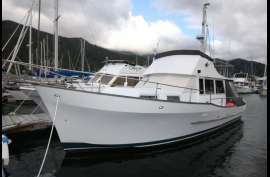 I have attached some photos of the boat. The intention is for the boat to go into the water and I just need to have a 30 second check on the keel before it is put in the water. The dinghy should be on the upper deck and it may need to be tied down for road transport. Thank you so much for all your help & assistance with our purchase of "Jayne", the many taxi rides, honest advice and professional approach to our new home were very much appreciated. You are fantastic to work with and made the whole experience enjoyable and relaxed. Chit Chat is now safely on her swing mooring in Tikao Bay... arrived back on friday. My taking part in the sail back was highly valuable to me, I experienced a range of conditions which I would normally have been cautious to undertake alone, Chit Chat handled everything with ease and my confidence has benefitted greatly. I did want to thank you in particular for introducing Hans Van Berlo to me for this delivery. I am rarely so impressed with someone's aptitude in a situation as I am a bit of a perfectionist and come to expect these things (perhaps not an ideal customer in many ways ! ), I do have to say though that Hans seamanship ability and perhaps more importantly in a case like this... his ability to mentor, re-assure and his way of dealing with challenging situations with a calmness that instilled confidence in me , left me very impressed. Hans was very patient with any concerns that I would have along the way and was prepared to wait out any situation I wasn't sure about, I learned very quickly however to totally trust Hans' call and was actually enjoying conditions that I would have been very aprehensive about at the beginnning of the journey. I can't say enough about Hans really and would be very happy to provide a reference to anyone who considers Hans in future for a similar situation. I would like you to know how much we appreciated the skill and professionalism of Brent Cameron and Pip Strack in negotiating the sale. Brent’s advice on presentation and pricing was invaluable and the advertising material and campaign undoubtedly helped to produce a timely sale. Pip was very efficient in handling the sale with excellent communication and negotiating . Please pass our commendations on to them.